2013: Following work within the community on collecting and distributing food to the needy - both the United Reformed Church and Hope Church had good experience of dealing with the scheme, having 'grub tubs' for food donations in place for some time - Dave Bagley of Urban Outreach (Bolton) was invited to the WCN meeting in February (21/3/13) to talk about and take questions on Foodbanks, giving a background to why they are needed, take-up within Bolton and Westhoughton and how as a community network we might come together to co-ordinate this as a mission within the town, using our network of Church, community groups and even schools to establish and build a Foodbanks resource. 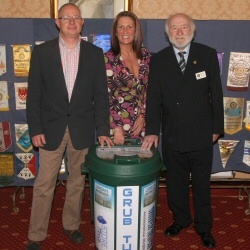 Deciding to take this idea forward, a WCN Sub-committee was established, first meeting 5th March with Dave Bagley in attendance (minutes), and worked with Urban Outreach to set-up a network of non-perishable food donation points with Grub Tubs. Each week all collections would be amassed at The Hope Centre on Central Drive, and then working to a rota donations would be taken to the main Storehouse (Salop Street warehouse) in Bolton to be shared as required by recipients across Bolton including Westhoughton, helping many families and individuals going through tough times. 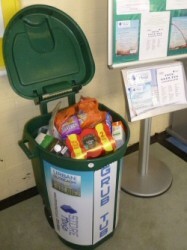 Starting off with 8 donation points there are now 14 'Grub Tubs' around Westhoughton, plus one other at Sacred Heart Church which donates to the Trussell Trust in Farnworth. Even the High School has a Grub Tub collection around Christmas. The WCN network has worked very well over the years making a significant contribution to the needy in Westhoughton, also involving itself in other initiatives such as BL Lunches and Christmas Hampers. Originally set-up as a Church and Christian initiative, working with various support agencies, individuals and families are given help and support as per a time-limited voucher system, with Urban Outreach (01204 385848) using volunteers to pack and distribute food parcels. 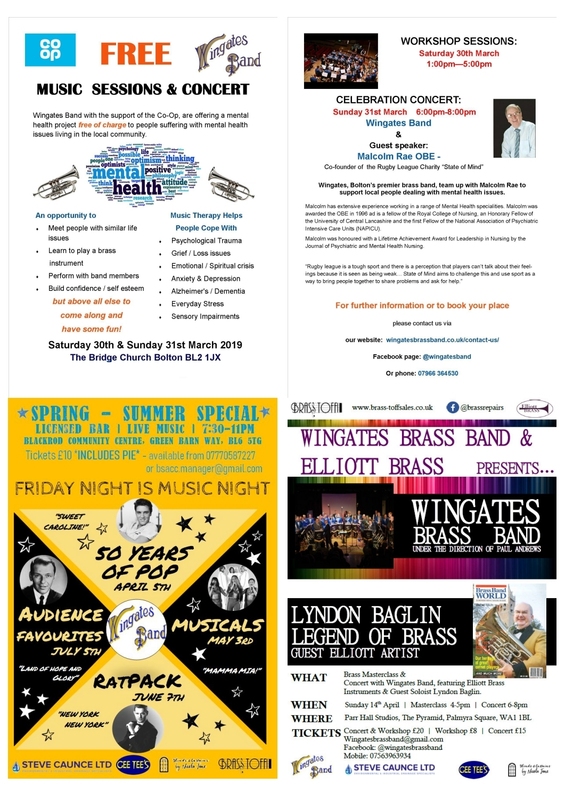 Food can be donated at: The Hope Centre on Central Drive; St. Bartholomew's Church; St. John's Church, Wingates; the Methodist Church on Wigan Road, The Bethel (Westhoughton United Reformed Church) on Park Road, St. James in Daisy Hill, St, Georges on the Hoskers, St Thomas' on Molyneux Road and the Westhoughton Pentecostal on Bolton Road. In addition, grub tubs can be found at Westhoughton Market, the John Holt Centre on Birch Avenue (open most days and evenings), The Hub (Central Drive) as well as the supermarkets, the Co-op and Sainsbury's. Tins, jars, non-perishable items; also toiletries welcome (toothpaste, shampoo… . (List of items.) In recent times, the 'Fresh as a Daisy' campaign has been launched to encourage donations of female sanitary products. Westhoughton collections from the Grub Tub network for onward distribution though Urban Outreach are made on a weekly basis (Tuesdays). 2016-17 (Dave Bagley update for WCN): Between 1st March 2016 and 28th February 2017, Urban Outreach provided 44,500 Bolton Lunches; 1,221 Christmas Hampers, serving 4,005 people. A total of 3,816 vouchers were processed feeding 7,321 people. The Pantry was accessed 3,471 times, feeding a total of 9,213 people. Winter Watch provided 3,500 meals. Total number of all the people we fed in the year was 68,539. 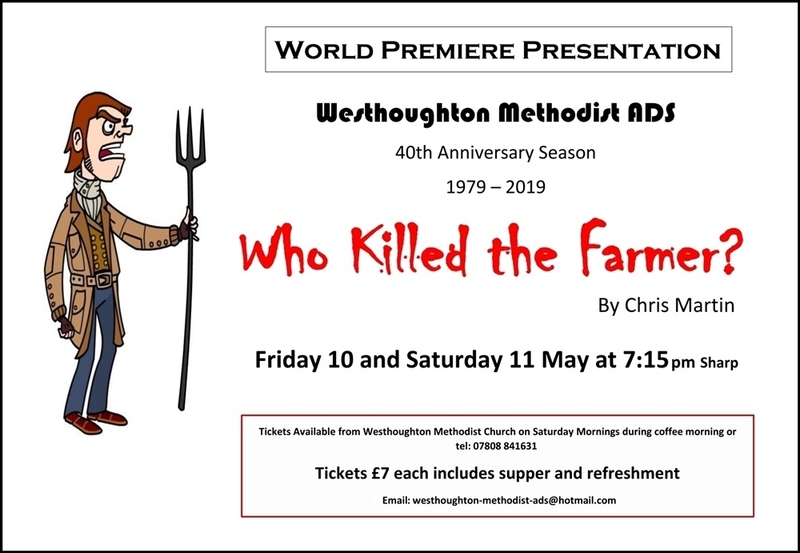 For Westhoughton, 203 people were fed thought Storehouse. The BL Lunches summer holiday initiative (for school children in receipt of free school meals), saw between 35 and 40 lunches per day delivered; over the 2 weeks 1,050 and 1,200 lunches. Unfortunately it has not been able to provide up-to-date figures due to changes in how they are compiled - 2015 figures indicative. 29 Families had 129 food parcels in Westhoughton (BL5). 3027 Food Parcels were given out, which fed 1967 people (1230 adults; 737 children). 1992 collected from Storehouse; 1028 delivered by volunteers. Across the Bolton Borough, including other providers, local welfare provision provided for 2213 people (Adults 1460; Children 707; Babies 46). Including School Lunches and Christmas Hampers in 2015 Urban Outreach fed 41,807 individuals. Local Welfare Provision is a global provision supported by the Local Authority working with a number of agencies. In 2014, 2759 vouchers for food parcels were given out across Bolton, which fed a total of 3826 Adults and 2746 Children [6572 in total]. Provision in previous years 2013 - (1283); 2012 - (1912). In 2014 a free school lunch scheme was piloted providing 500 lunches to children in BL5 the summer (14,000 across Bolton). The scheme was repeated and expanded during the school summer holidays of 2015 - 612 lunches were provided to children in Westhoughton (33,747 across Bolton). There were 19 collection points across Bolton, with the Washacre Children's Centre handling Westhoughton's lunch distribution. In total 300 volunteers made the scheme possible. The Children's Lunch Scheme ('BL15') ran from 27th July to 4th September (Bolton News article), with funds raised to cover the cost (£1) of each lunch for children who would normally get free school dinners. The scheme was made possible by an Aviva Community Fund grant, business and fundraising donations, and the support of Bolton Council. 1000 packed lunch meals a day were given out (up on the 600 per day in 2014). BL Lunches has proven to be a great success, and working with Primary and Secondary Schools has continued every summer since. In 2018, BL Lunches can be collected weekdays from the John Holt Centre on Birch Avenue or Westhoughton Library on Library Street between 11.00am and 12 noon from 23rd July to 31st August (exc. Bank Holiday on 27th August). 1300 hampers were given out assisting 1907 adults and 1720 children, with 1271 chickens. In 2014 the figure were: 950 hampers given out assisting 1502 Adults, 1457 Children. 2013 - 600 'Jesus Hampers' were given out. The huge operation on 23rd December between 11am and 2pm, making use of a disused retail store as a warehouse and packing facility, had over 100 different teams/organisations from statutory agencies, housing providers, Churches, schools and voluntary organisations, arriving to pick up the hampers for delivery to those individuals and families nominated to receive this welcome Christmas gift and act of kindness. "When I knocked on the door and introduced myself and then said 'Christmas Dinner on Jesus' it was for a surreal moment like I was an angel or apparition to this lady and her family. I will never forget how she looked at me. After handing over the hamper, chicken and vegetables, not to forget the selection boxes to the children, she threw her arms around me and squeezed me so tight. We stayed like that for a little while. Thank you for allowing me to do this today. I will remember this day for the rest of my life." There has been considerable media coverage of Foodbanks in the media, the generosity of people within the community has had a positive impact on people going though hardship. Just before Christmas 2014, WCN was contacted by e-ON in Horwich and some 50 bags of food were collected and donated by their staff. Urban Outreach are very grateful for the work don in the community by Westhoughton groups and individuals in helping make a little difference to those going through difficult times. Christmas Hampers have become an feature of the Christmas period, well supported by both the business and community sector, helping and bringing a little joy into the lives of families in need. Storehouse is Bolton's food distribution project, coordinated by Urban Outreach Bolton and The Bridge Church. Urban Outreach is a local charity established in 1990 providing support for the most vulnerable adults and young people in the Borough. The charity has an excellent track record of delivering innovative support solutions to male and female ex-offenders and those at risk of offending; re-housing and resettlement for those experiencing homelessness and one to one support for children who have been reported missing from home. The Charity has operated a weekend winter night café called Winter Watch for over 15 years, providing a safe and warm place for people to receive a meal, shower and experience warm hospitality and friendship. The winter café runs between January and March: Friday - Sunday evenings and assists on average 70 people a night. Storehouse operated from The Bridge Church since 2004, providing emergency food parcels for those experiencing hardship. As the church struggled to cope with demand, a partnership was formed with Urban Outreach to establish a weekly collection point at the Winter Watch café premises (The Restore Centre, Pool Street, Bolton) in 2011. A voucher and third party referral system from key agencies across Bolton was launched, together with an evening delivery service to those most in need. This approach has been piloted and it is now at a point of transition and growth to develop across Bolton. Illness resulting in inability to work and associated reduction in income. Repayment of debts or fines or payment of essential bills such as heating/utilities. Benefit problems i.e., suspension or transfer to different benefit due to change in circumstances. Accommodation issues i.e. homelessness, fleeing domestic abuse, leaving hospital. Additional caring responsibilities e.g. caring for children due to parental mental health or substance misuse. 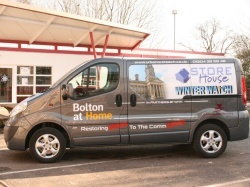 There are now over 55 agencies across Bolton that are given Storehouse vouchers and can refer people to the service. Vouchers are given to the household who exchanges it for food at the collection centre. Storehouse provides food up to 8 times (8 collection weeks), with the possibility of extension in certain cases. Referrals are logged and only one referral is accepted for each household unit. The food bag given currently provides food for about 2/3 days and its quantity is adjusted according to household size. In partnership with Winter Watch, Storehouse benefits from the amazing generosity of over 60 schools - 15,000 children and over 100 churches donating harvest food each year to build a food bank. Local companies also give food supplies (e.g. Warburtons, Sainsbury's, Carrs). The coordination and production of vouchers, food storage facilities and the use of the Restore Centre each Monday for collections is provided by Urban Outreach Bolton. The Bridge Church provides access to food through bulk purchasing through FareShare; has a part time volunteer coordinator and volunteers at the collection point and for the delivery service. The project currently relies on charitable donations and volunteer time to operate. All volunteers are CRB checked, undertake training and adhere to a Storehouse Code of Practice. Urban Outreach has a vision to develop a network of collection and delivery hubs across Bolton to meet the growing need. Urban Outreach is witnessing an increasing demand for emergency food from Storehouse. In the current economic environment, individuals and families are struggling to feed themselves. Local housing allowance changes, including a cap on weekly payments to those in private rented accommodation based on the number of bedrooms each household qualifies for, and an extension of the 'shared accommodation rate' up to the age of 35 is beginning to have an effect on some of the most vulnerable in Bolton. Existing renters are struggling to meet rent levels where they experience a reduction in Housing Benefit. Under occupied accommodation and those with non-dependents are also being affected. The 'rent gap' experienced will impact a person's weekly budget, thus having a knock on effect on money left to buy food. Other issues are also contributing to food needs. These include unexpected redundancy or loss of work, delays or changes to benefits; increased fuel costs and other bills; debt and family breakdown. Urban Outreach anticipates that the greatest impacts of the recession coupled with welfare reform are still to come. In recent months, Storehouse has on average provided 50 food parcels a week from one collection point, representing approximately 200 individuals. This has increased from an average of 30 food parcels per week six months ago. It is now struggling to keep up food supplies to meet the demand and anecdotal evidence from partner churches indicates there is much 'hidden need' within their local communities. Urban Outreach seeks to extend the Storehouse project into a network of food collection and delivery hubs across Bolton's local communities. This would be coordinated by Urban Outreach in partnership with churches working in local communities. Church premises would operate as collection points. Urban Outreach has secured funding to purchase a food van to assist in collecting food donations and to help with the delivery service. Urban Outreach recognise that a 'food need' is a door into individuals and families that are struggling and we are committed to providing an access route to additional support services where required. Our collection and delivery points can also act as hubs to disseminate information from partner agencies and funders (e.g. literature within the food bags etc.). Delivering to those most in need breaks down isolation, builds community relationships and provides a gateway for the recipient to access further services that they may not have previously had contact with.